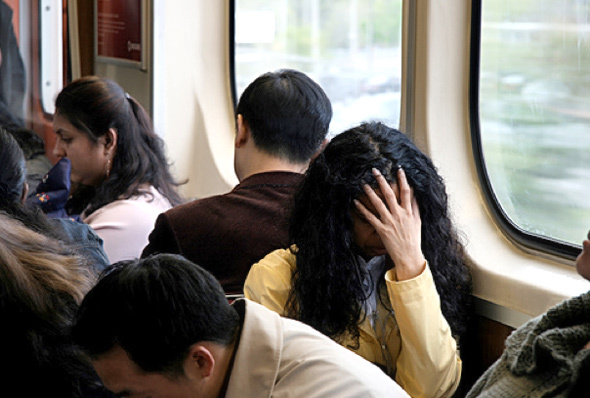 Should There Be a TTC Riders' Bill of Rights? The TTC is looking to outside experts to help them improve customer service. With the recent fare increase and a 15 per cent rise in rider complaints in 2009 (31,000 in total), most would agree that something needs to be done to enhance the experience of riding public transit in Toronto. But, the cynic in me wonders if this isn't just one big PR move. With ridership on the decline and customer dissatisfaction reaching alarming levels, this newfound commitment to better service rings a bit hollow. And, with the cost sure to run into the tens of thousands (and probably much more) for private consulting services, I'm forced to wonder if there is -- ah hem -- a better way. Despite the staggering number of customer complaints that serves as the putative impetus for the putting together of a blue-ribbon panel, I've yet to hear Adam Giambrone indicate that the commission plans on soliciting extended advice from its ridership in connection with this initiative. On the other hand, he did drop a hint that an airline industry representative might be one of those appointed to address the problem. Judging by the recent experiences of countless fliers, such an individual will likely have a glut of experience to lean on. But, I wonder if this is the best industry to turn to for help. It wasn't so long ago, after all, that disgruntled fliers deemed it necessary to form the Coalition for an Airline Passengers' Bill of Rights. After numerous instances of customer neglect on planes stranded on runways, a small but vocal group decided that enough was enough. Well, that group has grown to over 25,000 strong, received much media support/attention, and made significant strides toward holding airlines accountable for their actions. On December 21, 2009 the U.S. Department of Transportation (DOT) announced a new set of strict rules for the treatment of airline passengers. Chief among them is the stipulation that airlines must let passengers off planes that have been stuck on the tarmac for three hours, regardless of whether airport gates are overbooked. Failure to comply with the DOT's policies will now result in fines of $27,500 per passenger. While no one riding the TTC is likely to be stuck for three hours on a subway or a streetcar, the recent rash of subway line closures has surely seen some people's commutes delayed beyond the point of minor inconvenience. And if anecdotal evidence is to be trusted, the number of people who feel that they're consistently treated unfairly while riding the "rocket" is rapidly increasing. Just the other day I was reading complaints from riders who are regularly forced to wait while streetcar and bus drivers stop to take unannounced breaks mid-route. I've experienced a few of these waits myself, some lasting as long as 20 minutes. I appreciate that drivers are entitled to breaks and that the nature of their job makes it difficult to schedule them easily and conveniently, but the notion that it's acceptable for riders to sit trapped on a static bus for anything more than five minutes is ludicrous. So perhaps the time has come to form a coalition for TTC rider rights. There's been attempts to institute one in New York for a number of years. And Boston already has one that stipulates, amongst other things, that a delay lasting over 30 minutes is grounds for a refund of fare. That this idea is less than revolutionary, however, is no reason to frown upon it. Given that the TTC is only now taking the step to review their customer service on a macro level, one could be forgiven for not holding his or her breath waiting on concrete results via self-governance. When the first stories of passenger outrage at their plights on the tarmac came out in 1999, the airlines responded to the pressure with the Customer Service Initiative, a document that was squarely criticized by industry pundits for continuing to absolve the companies of any responsibility for customer service failings. Will the TTC's soon-to-be appointed panel produce something of a similar shape -- lot's of pledges and promises, but nothing with any real teeth? I strive to be level-headed and realistic when it comes to the shortcomings of the TTC. As such, I don't expect that commuting will be inconvenience-free. But, the funny thing is that it wouldn't take a whole lot to keep me happy. 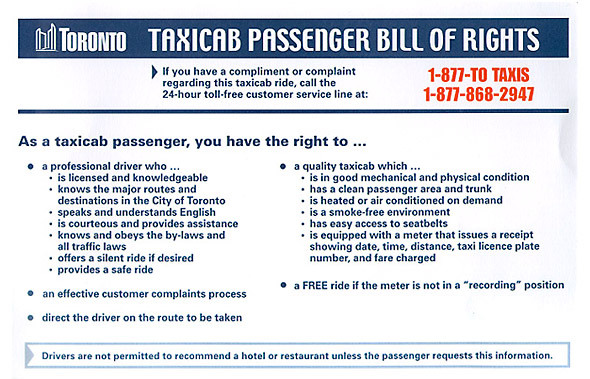 Hell, even a passenger bill of rights like the one found in taxicabs would be a start. A little attentiveness goes a long way. For instance, an honest explanation and a heartfelt apology are often enough to quell the bitterness that wells up over the course of a long delay. And a mere smile from a fare collector can help to make the prospect of a long commute more palatable. Most of us know a customer uprising won't be a cure for all that ails the TTC. Not only is the system chronically underfunded, but an enormous number of citizens rely on public transit so heavily that they're powerless to boycott it in a meaningful enough way to effect change. Yet, it's also clear that the TTC continually fails to meet the minimum requirements of transparency and accountability that one should expect of a service-oriented organization. And given its track record, the chances that the recommendations of the panel in question -- even it is comprised of outside experts -- will finally mean that "the better way" lives up to its name are dubious at best. So instead of engaging in yet another complaint-sharing therapy session, I'd be fascinated to hear what you think a hypothetical rider bill of rights should include. Refunds when a delay lasts longer than 30 minutes, as is the case in Boston? Consistent delay notifications for those waiting at station platforms for buses and streetcars? Better knowledge of routes and neighbourhoods on the part of drivers? Minimum standards of cleanliness? A free ride on your birthday? Who knows, maybe somebody will actually listen. Photos by Mike Campbell Photography and karenclaire, members of the blogTO Flickr pool.